Salna is a Great Accompaniment for Parotta's & Kothu Parotta. It is a Popular Road side dish served in Road side Hotels in Tamilnadu. It can also be served with chapathi's,Roti's,idli's, dosa's,appam & idiyappam. 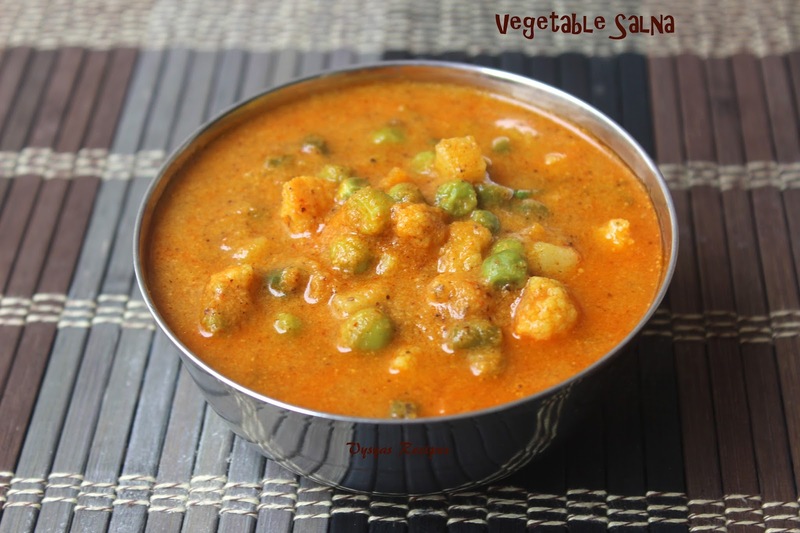 Vegetable salna is made with veggies & freshly Ground Spices, Spices brings nice aroma to the Gravy. Today we will learn to make Vegetable salna. Green Peas - 3/4 cup. star anise - 1/2 . Cook the Green Peas Seperately till soft in a kadai with needed water. Cut the veggies into cubes & put chopped potato in water to avoid discoloration. Heat a tsp of oil in kadai, when it is hot add cinnamon,cloves,cardomom,bayleaf,star anise,fennel seeds & coriander seeds. Saute everything in a low medium flame. When you get Good smell from Spices, add Onions, Ginger & Garlic. Saute till onions turns transparent, then add tomato, saute till it turns mushy.Now add Coconut & give a quick mix, switch off the stove.Coconut gets cooked with heat of the kadai. When it cools down, grind everything into a fine Paste with needed water.Now Ground Paste is Ready. Heat the oil in a kadai, add star anise & fennel seeds, saute till you get Good aroma from spices, then add all the cut vegetables (carrot,beans & potato) , saute in high flame for 2 minutes with little salt,(for faster Cooking) then add needed water,cook it covered till the veggies are soft, then add Ground Paste, Cooked Peas, chilli Powder & turmeric. Mix well. Let it cook in a medium flame for few minutes till it gets gravy consistency & you will find oil floating on top. Now Garnish with fresh cilantro. yummy Salna is Ready. Adding little salt to Veggies & cooking it in a high flame, makes the veggies cooks faster. I prefer to cook in a kadai, rather than cooker for Good taste . Adjust the water according to the consistency. 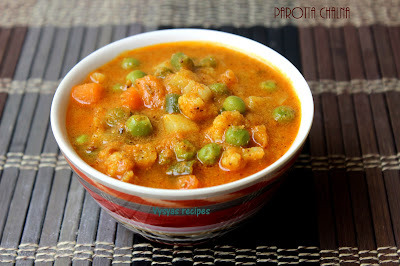 Adding Green Peas & cauliflower gives nice taste to Gravy. Serve Salna with Parotta's, chapathi,Roti, idli,dosa,Appam & idiyappam. Looks delicious and beautiful clicks. Nice recipe. Thanks for sharing..